In February I attended and spoke at the ETF industry’s main event, Inside ETFs, hosted by ETF research leader Index Universe. 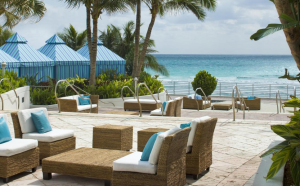 This gathering was held at the spectacular Westin Diplomat in Florida. It was a mix of close to 1,500 registered investment advisors, ETF Sponsors, stock exchanges, ETF model portfolio managers, index providers, trading and research companies. A view toward the ocean from the Westin Diplomat. CNBC was on hand to broadcast live from the event. Bob Pisani interviewed product providers on their outlook toward ETFs and the markets overall. I was invite to be part of a group that rang the NYSE Opening Bell from Inside ETFs to celebrate the 20th anniversary of the first ETF, which trades on the NYSE ARCA platform. The following day I moderated a panel of experts discussing crisis investing using ETFs. Needless to say, this three day conference was a whirlwind of activity and I thought I’d take moment to deliver several insights from the event. First, it seems as though Vanguard and iShares are head and shoulders above the other ETF providers in terms of their presence and commitment to the ETF space. Yes, on face value Vanguard was the premier or “Diamond” Sponsor of the event and thus had the most invested in the conference. Martha King of Vanguard was a superstar as a conference chair. She wisely threw her support behind the need for professional financial advice. One memorable quote went something like, “Financial advisors are the difference between making a wish list and having a plan.” Two sponsorship levels below resided iShares however, and their presence was felt almost as strongly. 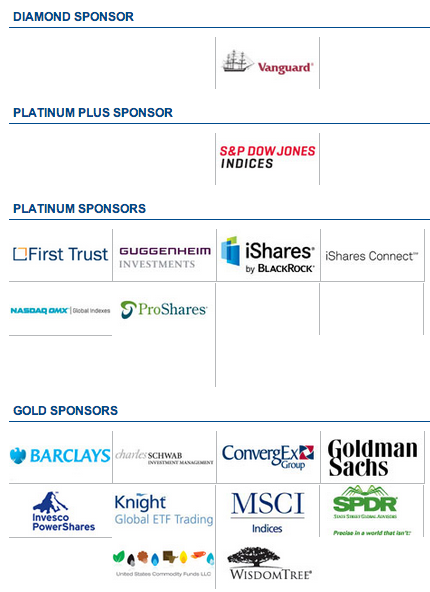 Before I get into that, here’s a visual summary of the top tier sponsors from the Inside ETFs homepage. The “higher level” Inside ETF sponsors. Both Vanguard and iShares went beyond the typical booths and essentially had compounds at the conference. Vanguard had the prime location outside the entrance of the exhibition hall. Perhaps 30 feet long, this piece of Vanguard real estate was staffed by several and featured several computers and flat screens. Oddly enough, though perhaps not in a crowd full of registered investment advisors, I never saw it very busy. iShares was directly inside the hall facing the entrance. Their small compound actually (which looked a bit like this) had a mini lounge with chairs and plated glass partitions. I never saw this booth empty of attendees! In addition iShares had another more standard booth which essentially promoted managed ETF portfolios, but more on that later. Both Vanguard and iShares dwarfed all the other standard booths and certainly made an impression visually and sub consciously. I heard more than one advisor say to another, “I’ll meet you at the Vanguard area or the iShares lounge.” Not only are these leading ETF providers in terms of assets, they were physical points of reference at the conference. Well played Vanguard and iShares! Another observation from the conference was the anti active ETF sentiment expressed by a variety of participants — especially financial advisors. The historical roots of the ETF industry — passive / index investing — are very strong. One session I attended had an advisor stand up to ask a question that instead ended up turning into a rant against active ETFs. His point, “active ETFs are only going to benefit ETF Sponsors, not investors.” Why? “Because active management doesn’t work.” That financial advisor’s opinion was addressed by the panel composed of several ETF veterans, including a top tier index based ETF Sponsor now launching active ETFs as well. The response was that “not everything could be easily indexed” and that “in some cases active management might be more appropriate due to the flexibility it offers.” What was likely not lost on the crowd however is that very few active ETF products actually are investing in so called “challenging” areas. Nevertheless, the anti active management crowd was alive and vocal. Active ETF opponents will not be too happy over the next year however as Index Universe CEO Jim Wiandt pointed out that of around 50 new ETF issuers on file, many seek relief to launch active ETFs. What remains to be seen is whether active management proponents begin to increase their influence in the industry. Currently only AdvisorShares is a consistent advocate of active management. Perhaps PIMCO, with their active ETF success, will elevate the representation of active management in the ETF industry. For now however, passive investing sentiment dominates, with only a hint that active management is anything other than foolish. In part two of this article I will share several other insights on ETF model portfolios and social media usage from the conference.